As part of a creative momentum project we have developed a series of indices assessing different aspects of creative and cultural sector development in the project partner regions. Our ‘Creative Enterprise Index’ measures the relative regional performance of the creative industries across a creative momentum project regions. The West of Ireland’s key strength emerging from the Creative Enterprise Indices is its performance on the Architecture, Design and Photography Sub Index. The sector shows relative stability over the 2012 to 2015 period. The South East Northern Ireland region’s best performance was on the Architecture, Design and Photography Sub Index. However its score showed a decline over the 2012 to 2015 period. Mid Sweden performed well across the Creative Enterprise Development Indices. Northern Finland’s highest performance was on the Engineering, Research and Development Sub Index. North East Iceland performed best in the Engineering Sub Index, followed by the Architecture, Design and Photography Sub Index. Both showed growth in their scores over the 2012 to 2015 period. 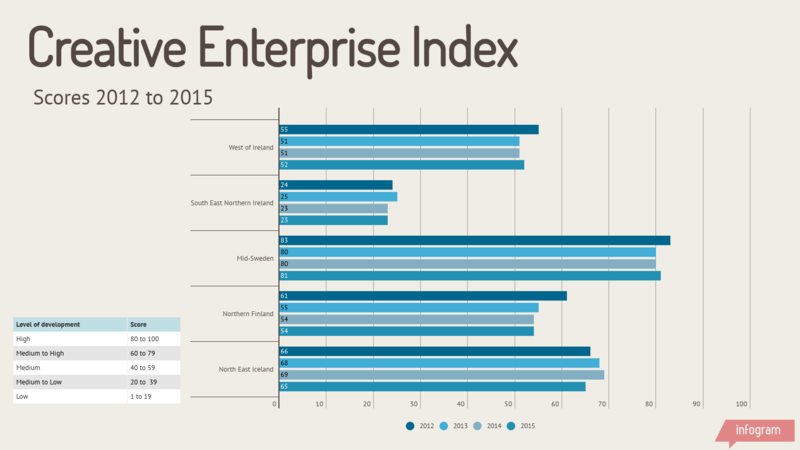 Download the Creative Enterprise Index report to find out more.